When you write an essay or an exam question, you read it afterwards. And again. And again. Why should your yearbook be any different? Checking publications for errors, or “proofing”, has been a part of the print industry for as long as it’s been around – with good reason. Traditionally, proofing a yearbook would have meant requesting a printed copy from the publisher. Nowadays, this is no longer the case. With a modern, powerful yearbook editor, you can view and edit your proof in real time, making adjustments on the fly until you have it just right. You’re only one person. You don’t have to do everything by yourself. By assigning sections of your yearbook to specific team members, you can ensure your yearbook is being checked over by the best people for the job, and prevent people from going rogue and editing things they shouldn’t be. A good way of dividing the work is to assign your photographers or graphic-savvy team members to image-checking duty, your language boffins to check names and text, and your yearbook organisers to checking the overall layout and page order. We all have friends that seem to have been born in another timeline and haven’t yet caught up to living in the 21st century. They don’t know their left-click from their right, and you don’t want to take the risk of letting them loose on your yearbook project. There’s a solution; it’s a bit old-school, but it works. 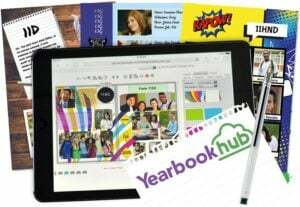 If you want, you can download a physical copy of your yearbook from Yearbook Hub and pass it around your yearbook team. Your tech-averse teammates can write their edits directly on the page for you to add online later. A stitch in time saves nine. An ounce of prevention is worth a pound of cure. Do not put off until tomorrow what you can do today. Basically, if you don’t fix problems ahead of time, they’re going to loom up and bite you, especially as your submission deadline gets closer. A powerful online yearbook editor will take the strain out of deadlines by letting you make edits on the fly from anywhere. Most editors will force you to download and install a clunky app, rather than letting you work straight from your browser. This is a big no no – if you don’t own the computer, there’s no way you’re going to be able to install some random app. The best way to work from anywhere is with cloud-based yearbook software that you can access from any browser. When the pressure’s on, you’ll be thankful to be able to work from anywhere. With Yearbook Hub, the most powerful online yearbook editor, creating your yearbook is a breeze. There’s nothing to download, as you can manage the whole team, your proof, and the approval process from your Internet browser. Work from anywhere and save it to the cloud. There’s more pre-made backgrounds, layouts, and clip art options than you can shake a stick at, and you can customise anything to your heart’s desire. Click around a free trial account today and try it for yourself!